South facing .87 acre of waterfront at the end of a quiet road on beautiful Pender Island. 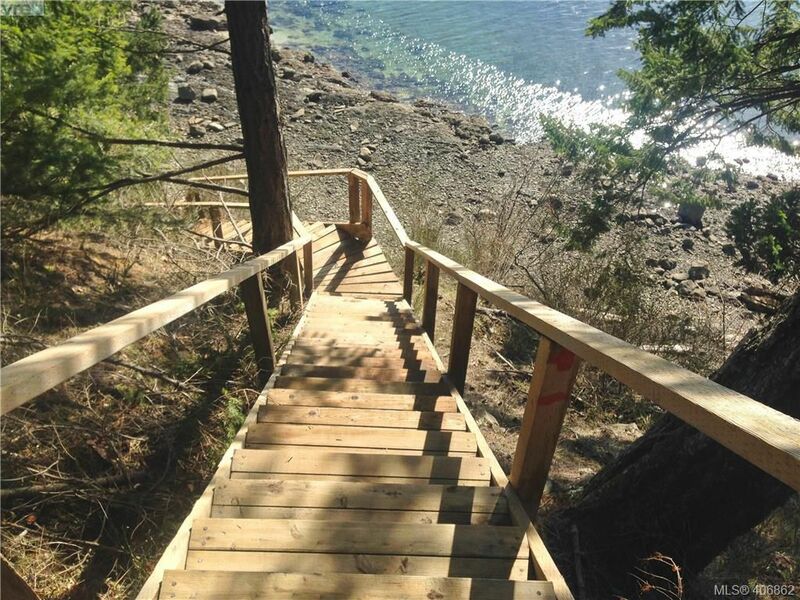 Stairs down to a beach within Port Browning Harbour, a great place to launch a kayak. Paddle in the harbour or take a left towards Saturna or Mayne. Currently there is a permission for private moorage agreement in place, ask for details and limitations. The home has two levels with separate entrances. The main level is great for retirement living, it has an open concept living and dining room surrounded by windows reflecting a true westcoast feel with vaulted wood ceilings, ocean view while surrounded by trees, making you feel like you are in a treehouse. Downstairs can be a great guest accommodation, with bedroom, sitting room and bathroom. B&B Maybe? A new roof in 2014. A gov’t dock a few minutes away. Razor Point Rd is Central to Pender, both the winery and driftwood shopping centre within walking distance. Mooring Buoy in place. Don’t miss this opportunity! Take ferry to Otter Bay, follow traffic to driftwood centre, left on Razor point, almost to the end on the right hand side.